The Fangchenggang Nuclear Power Plant is the first nuclear power project in western China. Image: courtesy of China General Nuclear Power Corporation. An artist’s impression of the Unit 3 under Fangchenggang NPP Phase II. Image: courtesy of China General Nuclear Power Corporation. The first fuel loading for Unit 1 was completed in September 2015. Image: courtesy of China General Nuclear Power Corporation. The construction of the Fangchenggang NPP Unit 3 started in December 2015. Image: courtesy of China General Nuclear Power Corporation. Fuel loading process at the Fangchenggang Unit 1. Image: courtesy of China General Nuclear Power Corporation. The project involves the construction of six nuclear reactor units, with a combined capacity of 6GW, in phases. The construction Units 1 and 2, which comprise Phase I, started in July 2010 and December 2010 respectively, whereas the construction works for Unit 3 under Phase II, which will also incorporate the Unit 4, started in December 2015. The Chinese NPP is being developed by Guangxi Fangchenggang Nuclear Power, a joint venture (JV) of China General Nuclear Power Corporation (CGN) and Guangxi Investment Group, in collaboration with Ratchaburi Electricity Generating Holding Public Company (RATCH), a subsidiary of the state-owned Electricity Generating Authority of Thailand. Phase I of the project involves the construction of two units of 1.08GW each, based on Gen-II CPR-1000 pressurised water reactor (PWR) technology. The fuel loading for Unit 1 was completed in September 2015, first criticality for the unit was achieved in October 2015 and grid connection was achieved later that month. The unit is scheduled to start commercial operations in 2016 following the application of related electric power business licenses and other documents. The equipment installation works for Unit 2 are currently in progress. The two units are designed to operate for 40 years. Unit I has an output capacity of 24GWh a day, which is sufficient to serve a medium-sized city in China. The two units under Phase 2 will have an installed capacity of 1.18GW each. They will each be installed with one HPR1000 (Hualong-1), Gen-III nuclear power reactor. The HPR1000 reactor technology was co-developed by CGN and China National Nuclear Corporation (CNNC). Its design integrates 177 core and localised nuclear fuel assemblies, three physically separated safety series, a single-reactor layout, double containments and stringent safety measures. Phase II is being developed as a reference for the proposed Bradwell B nuclear project in the UK. CGN plans to develop the latter project in collaboration with EDF. "Phase II is being developed as a reference for the proposed Bradwell B nuclear project in the UK." Alstom supplied its 6MW PA6-B emergency diesel generators, supply gas stripping and evaporation unit equipments for the Units 1 and 2. 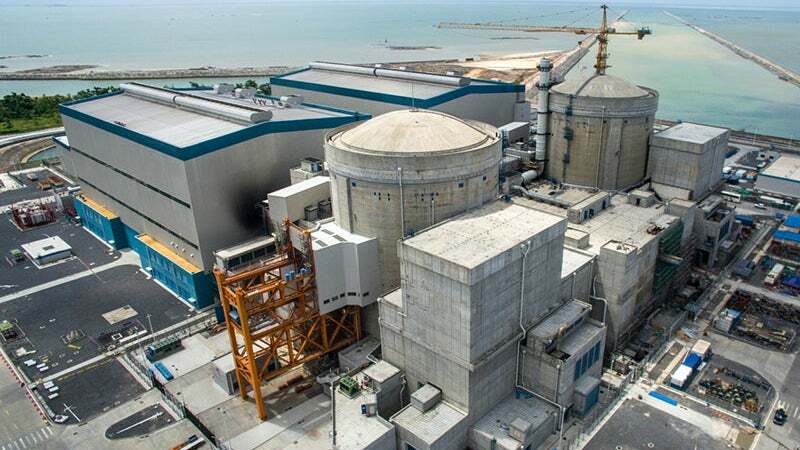 The automation and control systems for the two reactors were supplied by Hollysys Automation Technologies, based on its proprietary HOLLiAS-N platform. The digital instrumentation and control systems (digital I&C systems) were supplied by Mitsubishi Electric and China Techenergy Corporation. The main valves and pumps were supplied by SEC-KSB Nuclear Pumps & Valves and KSB Shanghai Pump, while the auxiliary valves were supplied by Dresser Masoneilan and the main steam isolation valves (MSIVs) were supplied by Flowserve. The pure austenitic stainless steel plates used in the reactor internal were supplied by Tata Iron and Steel Company (TISCO). The low-voltage and medium-voltage switchgears for the units were supplied by ABB Xiamen Low Voltage Equipment Company and ABB Xiamen Switchgear Company respectively. China Nuclear Power Technology Research Institute, a subsidiary of CGN, developed the two reactor refuelling robots for the project. The steam generators for the units under phase II will be supplied by Dongfang Electric Corporation (DEC) and Dongfang (Guangzhou) Heavy Machinery Corporation (DFHM), who further subcontracted BWXT Canada, a subsidiary of BWX Technologies, to manufacture and supply the steam generator components. The BOA Group manufactures flexible mechanical elements including steel and rubber expansion joints, bellows and hoses for the power industry. BOA bellows, expansion joint and flexible hoses offer reliable, safe and economical solutions to problems that are associated with the thermal expansion and vibration of piping systems and vessels. BOA products are designed to protect critical plant equipment from excessive forces and movements.